← Are There No Great Movies about the American Revolution? 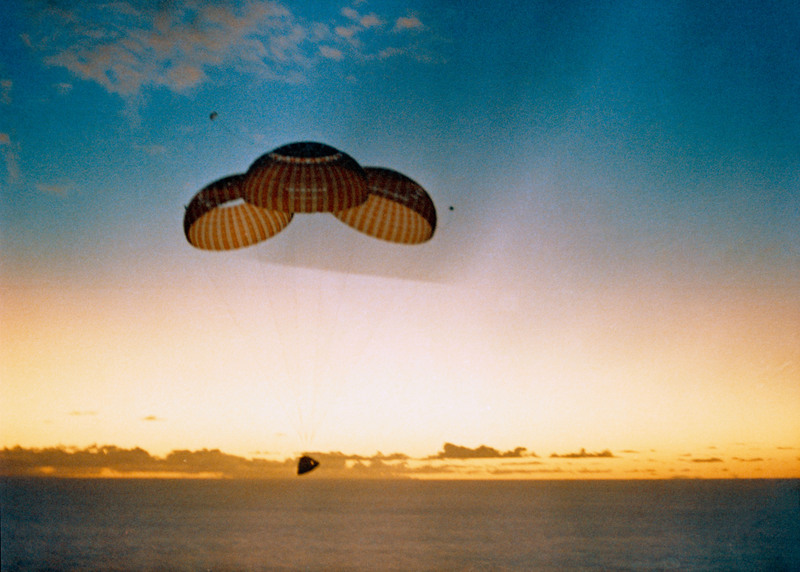 Apollo 11 Returning to Earth on July 24, 1969. Since July 24 is the 48th anniversary of the return from space of Apollo 11, here is a short account the return via parachutes of the Apollo spacecraft. The C/M-ELS begins operation upon descending to approximately 24, 000 feet +0.4 second, or in the event of an abort, 0.4 second after launch escape assembly jettison….The apex cover (forward heat shield) is jettisoned by four gas-pressure thrusters. This function is imperative, as the forward heat shield covers and protects the ELS parachutes up to this time. At 1.6 seconds later, the drogue mortar pyrotechnic cartridges are fired to deploy two drogue parachutes in a reefed condition. After 8 seconds, the reefing lines are severed by reefing line cutters and the drogue parachutes are fully opened. These stabilize the C/M in a blunt-end-forward attitude and provide deceleration. At approximately 10, 000 feet, drogue parachutes are released, and the three pilot parachute mortars are fired. This action ejects the pilot parachutes which extract and deploy the three main parachutes….The main parachutes are disconnected following impact. The recovery aids consists of an uprighting system, swimmers umbilical, sea (dye) marker, a flashing beacon light, a VHF recovery beacon transmitter, a VHF transceiver, and an H-F transceiver. Numerous interesting design details are contained in the Apollo parachute system. The reliability requirement of independent parachute deployment, coupled with large command module oscillations, necessitates divergent drogue parachute and main pilot parachute deployment angles coupled with positive thruster type deployment. The command module oscillations create the possibility of contact between the parachute risers and the hot rear heat shield, and last but not least, the increase in CM weight without an accompanying increase in compartment volume or allowable parachute cluster loads resulted in novel design approaches for parachute packing, storage and shape retention. Designed for use in both optimum and crisis situations either during launch abort of return from the Moon, this system was fully redundant and handled forces equivalent to 3 g’s without difficulty. Not all went well with every aspect of the Apollo parachute recovery system. A number of tests failed during the run-up to the missions to the Moon. For example, on September 6, 1963, an Apollo command module boilerplate, No. 3, was destroyed when one pilot parachute was cut by contact with the vehicle and one of its main parachutes did not deploy. Then rigging problems caused the other two parachutes to fail. An investigation led to rigging and design changes on future systems. As in this case, these difficulties were resolved and the program continued. As reported at the time: “The most probably cause of the anomaly was the burning of raw fuel (monomethyl hydrazine) being expelled during the latter portion of the depletion firing and this resulted in exceeding the parachute-riser and suspension-line temperature limits.” Based on this anomaly and its occurrence, only once in all of the missions to date, NASA investigators believed that there was only a 1 in 17,000 chance of failure on future missions. 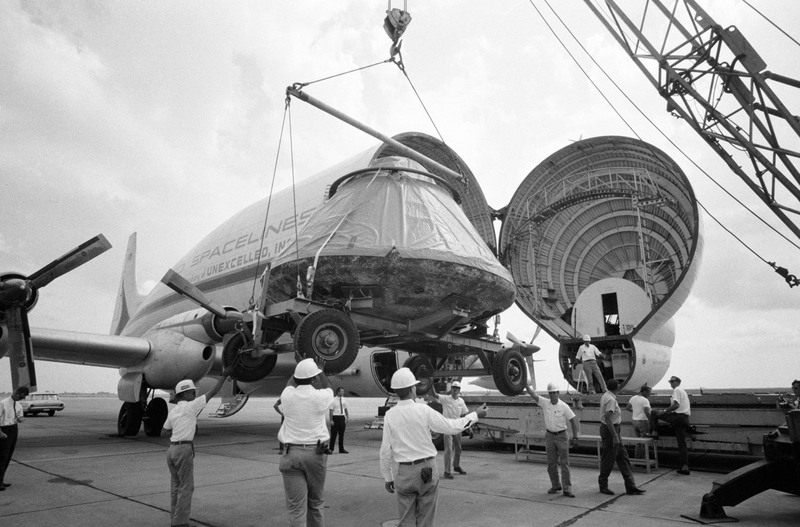 The Apollo 11 Command Module (107) is loaded aboard a Super Guppy Aircraft at Ellington Air Force Base for shipment to the North American Rockwell Corporation at Downey, California. The CM was just released from its postflight quarantine at the Manned Spacecraft Center (MSC). The Apollo 11 spacecraft was flown by astronauts Neil A. Armstrong, commander; Michael Collins, command module pilot; and Edwin E. Aldrin Jr., lunar module pilot, during their lunar landing mission. Note damage to aft heat shield caused by extreme heat of Earth reentry. expects to have a system that will be adaptable to Apollo. Their present effort is not aimed directly at incorporation of such a system, but rather at developing the technology and hardware necessary for the system itself. They are, however, basing their designs on a spacecraft that is of the CM size and type. The resulting system will most likely consist of a steerable parachute, plus some combination of landing rockets, deployable energy absorbers and stability aids. Bendix Products Aerospace Division is developing a computer program to analyze land-landing dynamics. North American Aviation is investigating landing gear systems for the Command Module. Pioneer Parachute is developing a parasail type of steerable parachute. Northrop Ventura is developing a cloverleaf type of steerable parachute. The primary concern was that this landing system handle a 14,000 pound capsule and be containable within a 1.5 cubic meter space. While this system was considered even less heavy and bulky than a water system, the addition of landing rockets to cushion a landing might push total weight above that already envisioned for the Apollo command module. “Probable weight increase and cost of incorporation must be weighed against the added capability and decrease in cost of recovery operations,” the study concluded. This statement was the first reference in this recovery literature from the 1960s concerning the very important trade engineers had to make between added weight and reduced recovery operational cost. The Navy was generally quite agreeable during the space race era to deploy their ships for recovery, and NASA was not required to pay for that operation. That made water recovery, at least from NASA’s perspective, not only the most expedient but also the lowest cost method of recovery. Even so, this program concluded without adopting anything more sophisticated than the parachute system used for Mercury, Gemini, and Apollo. It would not be until a return to canopies for some projects in the 1990s that NASA returned to the parasail/paraglider concept for landing. This entry was posted in Apollo, History, Space and tagged Apollo, Apollo 11, Apollo 15, cold war, Gemini, Gemini Earth landing system, Mercury, Moon, Moon race, NASA, North American Rockwell, Northrop Ventura, or parachute, parachutes, paraglider, parasail, Pioneer Parachute, Theodor W. Knacke, U.S. Civil Space. Bookmark the permalink.